Earth's oldest rocks containing what scientists heralded as the earliest evidence for life are under scrutiny. The rocks in question sit on Akilia Island off the southwest coast of Greenland. 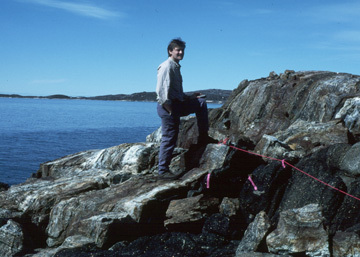 The island hosts a rock exposure of dark green, almost black, mineral layers alternating with white. Geologists first identified the outcrop as containing banded iron formations: a type of sedimentary rock precipitated from seawater. In this week's Science, a new geochemical analysis of the Akilia Island rocks claims the outcrop is not sedimentary but igneous - formed in the mantle under conditions too hot to support life. "It would be like going to Hawaii and seeing a lava fountain and looking for life inside that," says sedimentary geologist Christopher Fedo of George Washington University, in Washington. Fedo and Martin Whitehouse of the Swedish Museum of Natural History are casting a shadow of doubt over the earlier work of Stephen Mojzsis of the University of Colorado in Boulder. In 1996, Mojzsis and colleagues identified the rocks as banded iron formations with cross-cuts of tonalite that indicated an age of 3.85 billion-years old. To determine if evidence for life existed in these rocks, some of Earth's oldest, they studied the inclusions of graphite in the Akilia outcrop and concluded that the isotopic signature of the carbon came from biological origins. Martin Whitehouse on what he considers distinctly not banded iron formation on Akilia Island. Photo by Chris Fedo. While Fedo and Whitehouse support analyzing graphite particles for evidence of life in deep-sea sedimentary rocks, they don't believe the Akilia rocks fit the sedimentary requirement. Fedo and Whitehouse identified the white quartz layer as having a geochemistry strongly diluted from, but closely related to, the green pyroxene in the rocks. In the banded iron formation explanation, the pyroxene is considered a secondary intrusion of ultramafic igneous rock, creating veins that are not related to the origin of the white quartz layer. Indeed, Mojzsis says the white layers are quartz-magnetite, impossible to derive from an ultramafic rock. "That would mean a chimera of bizarre geological forces acting on a five-by-50-meter square area of Greenland," Mojzsis says. Fedo and Whitehouse argue that the magnetite makes up only half a meter of the total 5 meter-thick lithology, and that the presence of magnetite may have come from a metamorphic breakdown of another mineral or from hydrothermal alteration. The differences might be linked to looking at a marbled cake and watching bakers argue over its ingredient list. But even when the Akilia rocks are geochemically analyzed the geologists come up with two separate lists. One for a marine sedimentary banded iron formation and the other for a metasomatized ultramafic igneous origin. But Fedo and Whitehouse are distinct in that they take into account the severe deformation of the outcrop, Peter Appel of the Geological Survey of Denmark and Greenland. "I have visited the Akilia outcrops several times and was never convinced of the sedimentary origin of the quartz-pyroxene rocks in which the carbon was found," Appel says. "On the contrary a metasomatic origin is very convincing. This is supported by field evidence in the Isua [Greenland] greenstone belt, which is probably of the same age as the Akilia supracrustals." 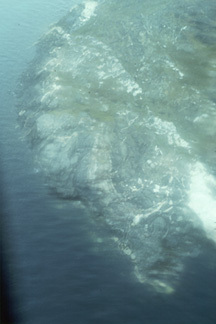 A helicopter view of the disputed rock exposures on Akilia Island, Greenland. Photo by Chris Fedo. Fedo and Whitehouse began working with some 40 other researchers in 1997 to study banded iron formations in Isua. When the weather was too poor for helicopters to fly into Isua, often the scientists would opt for the shorter trip from the airport to Akilia. As they continued to return to Greenland each field season, "the Akilia story had been weighing increasingly on a number of our minds," Fedo says. "Initially I had no intention to work on this stuff because I thought it was largely a done deal. After a couple of years of revisiting this place I was deeply concerned that the banded iron formation interpretation was wrong. Because the rock doesn't look anything like banded iron formation, at least it didn't to me," he says, adding that "It doesn't physically and it doesn't chemically."